Erhun Oztumer is pushing hard for a return to the Posh starting line-up at Millwall. Photo: Joe Dent/theposh.com. 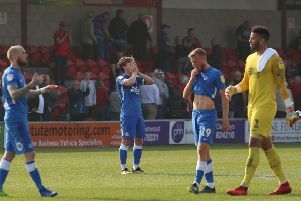 Peterborough United manager Graham Westley believes his side might have to win ‘10 or 11’ of their remaining 16 games to gain promotion from League One this season. Posh are on 44 points after 30 matches ahead of their League One fixture at Millwall tomorrow (February 20). The average number of points for the team finishing in the final play-off place over the last decade is 73. The average for teams finishing in second place and claiming automatic promotion is 87.4 and that will probably already be beyond Posh. Posh midfielder Harry Beautyman is fit to start at Millwall if required. Photo: Joe Dent/theposh.com. Posh dropped to 11th following the midweek League One results, but Westley at least watched Millwall lost at home to Scunthorpe on Tuesday (February 16). The sixth-placed Lions therefore remain six points clear of Posh ahead of the clash at the New Den. “Millwall losing was probably the worst thing that could have happened in a way,” Westley stated. “That result will steel them for our game. They obviously won’t want to lose at home twice in the same week. “Millwall actually played very well and had chances to get something from the game so they won’t be lacking confidence ahead of our game. “We have some ground to make up, but it’s a very close division and a string of wins will soon make the league table look very different. “It could be we need to win 10 or 11 our last 16 games to have a chance of going up. You can look at how many points have been needed in recent seasons, but no two seasons are the same. “To win promotion you have to win a lot of a games. It’s as simple as that. I wouldn’t call Millwall a must-win match though as there will still be plenty of points to play for after Saturday. “We are more than capable though. When I was at Stevenage we beat Newcastle in the FA Cup when we were 18th in League Two. Posh midfielder Harry Beautyman, defenders Ricardo Santos and Harry Toffolo, plus midfielder Erhun Oztumer are all pushing for starting places tomorrow after missing last weekend’s mauling at the hands of Bradford City. v Oldham, Swindon, Port Vale, Coventry, Crewe, Rochdale, Scunthorpe, Blackpool. v Millwall, Bury, Wigan, Doncaster, Fleetwood, Colchester, Barnsley, Shrewsbury.